Cape Cod offers some of the most beautiful seaside cottages and waterfront homes in New England. Enjoy everything that Cape Cod offers by owning a beautiful waterfront home. Sit back and relax on your private deck and enjoy amazing water views, beach access, and boating with a private dock. The historic charm provides a bounty of amazing views, activities, and living choices on Cape Cod's waterfront. 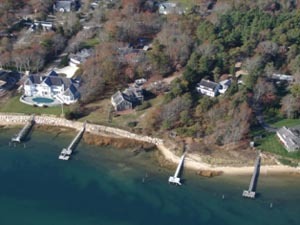 Discover a variety of Cape Cod waterfront homes for sale in the popular Cape Cod towns below. Click here to browse all Cape Cod waterfront homes. A Cat Boat plying the sheltered waters of Pleasant Bay. A sleek pleasure yacht anchored off the Elizabeth Islands. An offshore fishing boat steaming to the canyons. Boating on the waters that surround Cape Cod is why many visit and why many stay. The boating industry is one of the economic mainstays on Cape Cod and has been at the heart of the Cape's economy for hundreds of years. Area charter and tour boat companies transport hundreds of thousands of visitors out onto our waters each year for fishing, sightseeing, swimming, and relaxation. 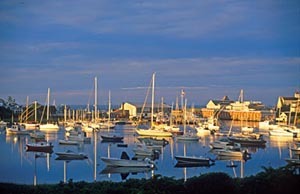 Cape Cod marinas host scores of visiting yachtsmen and provide water access to countless recreational boaters from all over southeastern New England. Whether you are looking for a sailboat to charter for the day or a 50-foot fishing boat to purchase, Cape Cod will float your boat. Click here for charter fishing companies on Cape Cod. Cape Cod’s beaches are considered among the best in the world, especially those along the Cape Cod National Seashore, a 40-mile stretch of unspoiled sandy beach in Outer Cape Cod. With 559.6 miles of unspoiled coastline, Cape Cod offers many beautiful sandy beaches for you to enjoy. Cape Cod tests all public bathing beach waters. Monitoring results from previous seasons indicate exceptional water quality on Cape Cod, and the Cape Cod National Seashore beaches are part of the Blue Wave Campaign for quality. For additional beach water quality information, click here. Click here for information on some of the finest Cape Cod beaches in our area. Before you head to Cape Cod beaches, check out Beachcomber's Companion© from the Woods Hole Oceanographic Institution. Contact us if you have any questions about Cape Cod waterfront homes.